The Humble Indie Bundle is now on bundle number 6 and with just a week left to go in the sale, they have added four additional games to the bundle. Humble Bundle, Inc, has a system in which customers to select how much they want to pay in exchange for copies of all included DRM-free games. A portion of the cost can be designated to go to a charity. The bundle now has ten titles and includes, among others: Rochard, an action-RPG; Space Pirates and Zombies, a space combat sim; and Vessel, a steampunk puzzle platformer. Many of the games come with a soundtrack. Gamers also have the option to benefit the EFF (Electronic Frontier Foundation) as well as the Child’s Play Charity. Both charities benefit gamers around the world. Shoppers that choose to pay more than the average amount originally were able to also download Dustforce, an acrobatic platformer. With the addition of the new games, however, any customer that chooses to pay more than the average costs receives four additional games and soundtracks. 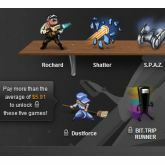 The update includes Wizord, an RPG block breaker; Bit.Trip Runner, a retro music platformer; Gratuitous Space Battles, a strategic sci-fi game; and Jamestown, an arcade style scrolling shooter game with neo-classical touches. The bundle is available for just one more week, and with a current average price of just $5.88, Humble Bundle has already sold nearly 230,000 bundles. The bundles are available for purchase via Paypal, Amazon payments and other payment processors on the Humble Bundle site. Heather is a freelance writer who loves to write about new and exciting technology. She also enjoys teaching robotics classes, making stop-motion videos and designing t-shirts.